Abipa Canada Inc. of Laval, Quebec, is a Tier 2 supplier of small to mid-sized aircraft engine and structural components. The company wanted to be more competitive with low-labor-cost countries and realized that having stand-alone machining centers with an operator stationed at each machine was holding it back. It specifically sought 5-axis machining automation in order to streamline its operation. Abipa’s goal was to produce parts at a ratio of at least 2-to-1 compared to previous processes, without adding labor. The new technology would also need to be flexible enough to expand as it pursued future cost reductions. As Abipa searched for the right automation and machine tool supplier, it worked closely with Makino and SST application engineers to prove out performance based on existing part applications. Makino and SST tested parts and developed a presentation to Abipa’s board of directors. The Makino solution had fulfilled each of Abipa’s criteria, which led the company to purchase a 5-axis machining cell that included a Makino MMC-R equipped with 20 fixture plates, and an a61nx-5E 5-axis horizontal machining center. 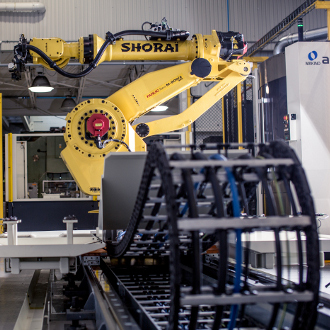 In less than a year, the company was already exceeding its 2-to-1 production ratio requirement without even taking full advantage of the automation capabilities of the a61nx-5E. In fact, the 5-axis machining cell is gaining the same level of productivity as two or three of its previous machines, without needing additional manpower. Depending on the part, the company has seen increased productivity ranging from 85 to 525 percent. Cycle time for one of the company’s smaller parts dropped from 58 minutes to 26 minutes. The cycle time for one of the company’s larger, more complex parts was reduced from 300 minutes to just 48 minutes. On one application, average metal-removal rates increased from 1.68 cubic inches per minute to 6.75 cubic inches per minute. The biggest contribution to this growth has been during the roughing process, where rates increased from 4.36 cubic inches per minute to 108.84 cubic inches per minute. The machine also enables Abipa to machine-bore features complete using 180-degree indexing. Diameter tolerances are held within plus or minus 0.0006 inch with matching alignment within plus or minus 0.0002 inch. Abipa continues to program new parts into the automated cell and better streamline its operations through 5-axis machining automation.